Strength: The dragon can fly Raphael anywhere and it can breath beams of Oblivion. Weakness: It gives off light energy as well which weakens Raphael. 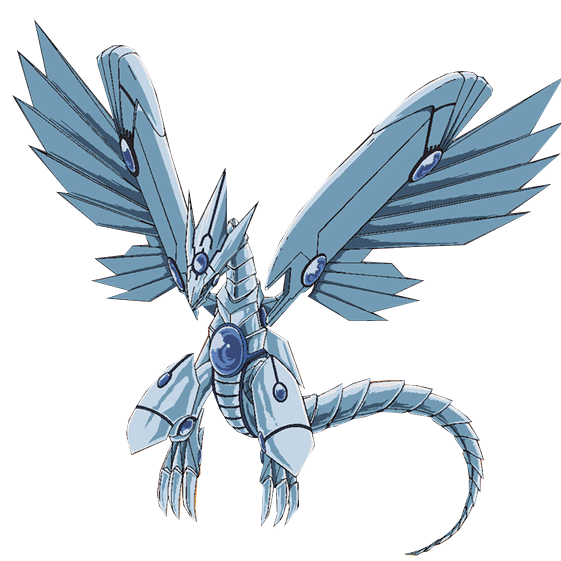 Appearance: The Dragon is a blueish silver mechanical dragon. The Dragon's body is segmented almost all around the body. The body also has blue crystals randomly around the body. Effect: The Dragon can breathe beams of pure Oblivion. These beams can destroy all that come in contact with them.If it hits an organic object it would hurt immensly. Also the dragon can compact itself into a small dragon the height of ones forearm. History: When machines became into bieng this creature was created. It grew as if it was organic and it acts as if it is. When Raphael was given this creature, it was just created. He has kept it as a companian since. Even when he was banished the dragon stood by him, as a child form. The beams of oblivion and flying?And the beams destroy everything they come in contact with?hmmm... thats god-modding a little. Boost it up to 30mp and as for beams make it to where they hurt the enemy,not destroy them. well i meant like...just destroys in-animate objects...the beams are pretty small so they can be dodged. okay i guess that will work. Still need 30 mp cost though since it is a rather large dragon and shoots beams and flies(of course dragons fly).